Sorry for the delay again in blog posts. This time I was in San Diego for a show. We travel to a few key shows around the country to book group travel each season. This year's schedule includes Dallas, San Diego, St. Louis, Salt Lake City, and Denver. If you've seen the news the last couple days, yes, the fires are as bad as it looks. There were too many evacuations to even keep track of but we hope that everyone makes it out in time. Our hearts go out to them. 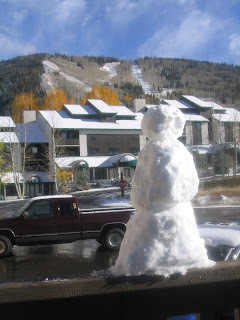 But while the wind and hot weather was the story in SoCal...it was all about snow here! There's still about 3 inches in the shade around the base area and that's after some melting yesterday. This was taken on Wednesday last week. First Powderhorn snowman of the season!